‘Eternal Father, strong to save’ with the tune Melita. As the ninth edition of the hymnal Ancient & Modern has been published — the most popular stable of hymnbooks in the Church of England — here is a little Ancient & Modern history, followed by a few thoughts on what the 21st century holds for hymnbooks. For my review of the ninth edition of Ancient & Modern, see Ancient & Modern: a review. The history of Hymns Ancient & Modern begins with a chance meeting on a train between two hymnal editors. In 1852, Francis Murray had published the Hymnal for Use in the English Church; William Denton had produced his Church Hymnal in the following year. Both were Tractarians, and their publications were part of a great flood of hymnals that rode in the wake of the Oxford Movement. Much of the content of these hymnals were archaeological recoveries of ancient and mediaeval hymns in Latin and Greek. John Mason Neale‘s Hymnal Noted (1852 & 1854) is the prime example of this tradition. Murray and Denton’s conversation on the train seems to have been about the problem of a profusion of hymnals targeted at the various niche congregations within the church. They gathered a group of hymnologists to form the future ‘proprietors’ of Hymns Ancient & Modern. Denton only remained with the project for a few months (possibly because the 1855 second edition of the Church Hymnal was starting to sell more copies), but the proprietors were now ably led by Henry Baker with William Henry Monk as music editor. They produced a trial selection of 138 hymns in 1859. In 1861, most of these found their way into the collection of 273 hymns the was the first edition of Hymns Ancient & Modern. The name of the hymnal referred to the fairly even division between the ‘ancient’ — patristic and mediaeval hymns, mostly translated from Latin — and the ‘modern’ hymns of the eighteenth and nineteenth centuries. The subsequent appearance of the Appendix to the hymnal in 1868 showed a desire to keep the book fresh. In 1875, Monk produced the second edition, being the first in a line of composers to steer the project, and it was this edition that cornered the hymnal market in the church. It was so popular that the 1904 New and Revised Edition, which was otherwise a perfectly decent third edition, was roundly rejected for rearranging hymns and giving them new numbers. This forced the proprietors to abandon it and return to the popular, previous Monk’s edition, bound with its supplement by Charles Steggall (1889), which became known contrastingly as the ‘Old Complete Edition’. In 1916, a second supplement was added by Sydney Nicholson, and, in 1922, he lightly edited the hymnal to produce the Standard Edition. Gerald Hocken Knight and John Dykes Bower took over as editors, producing the more heavily edited Revised Edition in 1950, adding new hymns and removing those that had not stood the test of time. In 1983 the pruning continued, with almost half of the hymns in the Revised Edition being removed and all 200 of the combined contents of 100 Hymns for Today (1969) and More Hymns for Today (1980) being uncritically added without being dispersed among the remnant, producing the New Standard Edition. Both the Revised (AMR) and the New Standard (AMNS) editions remain in use in many churches. In 2000, the hymnal was rebranded Common Praise as an accompaniment to the liturgy of Common Worship. 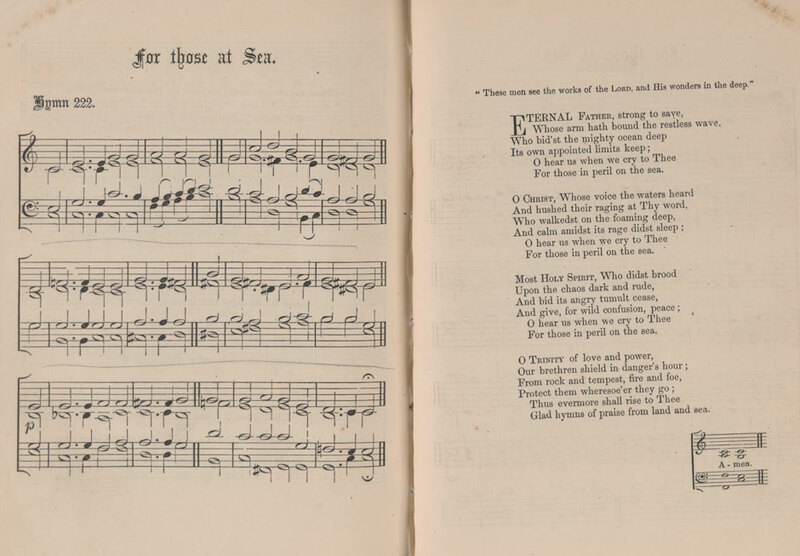 Common Praise included a fair number of hymns that were traditionally indicative of the rival stable of the New English Hymnal, which encouraged some churches and cathedrals that used the latter to make the switch, and continued the concept of it being a single hymnal of broad appeal. The supplement Sing Praise was produced in 2010 (New English Praise, a similar supplement to New English Hymnal came out in 2006). In 2013, these two were combined and edited together as Ancient & Modern, dropping the Hymns from the title. Some might question the need for hymnals in the digital age. A minority of churches use digital projectors to ‘shew forth’ hymn and liturgical texts for their congregations. Though this emphasizes the corporate nature of worship — singing from the same hymn sheet! — it can make worship something observed, something virtual. Only once in my life have I been to an Anglican church where everyone had a single volume of the Prayer Book bound with a hymnal, and that was in rural Co. Antrim. Most other churches present the worshipper with more or fewer books, booklets and sheets. Increasingly, hymn texts for the service are printed on a pew sheet, and hymnbooks have become the preserve of the choir and organist, and a resource directory for those who select hymns for services. The trend for ever larger hymnals (the latest edition of Mission Praise has 1250 entries) suggests that compilers recognise that the hymnbook has become more of a resource than an aid in worship, placing inclusion ahead of exclusion. It would be good to have a large scale survey of churches using this hymnal, at some point in the future, to see what the usage rate of each item is. I commented before that it would take 2½ years to sing through all 847 items without repeating one, given four hymns every Sunday morning and three in the evening. Of course, there are always going to be some hymns that are not to the taste of clergy, musicians and congregations, and others that are repeat favourites. Some of the liturgical items might be used week in, week out, or not at all. The question is how many hymns does an individual church need at any given time. A cheeky answer might be: only the few that we are singing in this service. However, my question is how big can an individual church’s repertoire of hymnody be. I am sure there is some variation here. One response would be to create print-on-demand hymnals tailored to a church’s choices and traditions, yet perhaps this might take us back to the disunity that Francis Murray and William Denton deplored when they met that day on the train. Categories: Anglicanism, liturgy, music, Uncategorized | Tags: Ancient & Modern, Charles Steggall, Church of England, hymn, Hymnal, hymnals, hymnbook, hymnbooks, hymns, Hymns Ancient & Modern, John Dykes Bower, John Mason Neale, New English Hymnal, Sydney Nicholson, William Henry Monk | Permalink. Ancient & Modern: Hymns and Songs for Refreshing Worship (2013). My copy of Ancient & Modern: Hymns and Songs for Refreshing Worship (2013) has just arrived. It is the ninth edition of what is the most enduring and popular lineage of hymnals in the Church of England. We currently use Common Praise (2000, the eighth edition of A&M), in the College Chapel. My former churches have used Sing Glory (1999), Ancient & Modern New Standard Edition (1983) and New English Hymnal (1986) as their main hymnbooks, which is progress of sorts! Unlike some churches, the Church of England has never had an official hymnbook, but the Ancient & Modern stable comes closest to a standard. For some background and a couple of thoughts about hymnals in the 21st century, see Ancient & Modern: history and future. Ancient & Modern has 847 items: the largest inventory in this hymnbook’s history, beating the 779 hymns of the Standard Edition (1916 & 1920). Not all of these are hymns, some are liturgical songs and ‘short chants’. It is not too much of a surprise that this is an increase on the 628 hymns of Common Praise. However, seeing that the intermediate supplement Sing Praise (2010) has 330 entries, there has been a bit of a cull. I guestimate that around 150 hymns in Common Praise have been cut (inexplicably, the cloying ‘In a world where people walk in darkness’ (CP 476, AM9 677) has survived!). I confess to some alarm that so many hymns that were thought necessary of inclusion 13 years ago have proved disposable. It makes me wonder how many of the current volume will last as long. The proprietors actually suggest that those who already have Common Praise should make the lesser investment in Sing Praise rather than switching directly to the new edition. I believe, though, that would mean that there would be around fifty or more items in the ninth edition that those with the two previous volumes would be missing. Physically, the full-music editions of the two hymnals, eighth and ninth editions, are about the same size. Although this is perhaps due to my old Common Praise being stretched with use, the paper used for the ninth edition is clearly thinner, yet this has not lead to a reduction in print quality. Unlike some poorly produced editions of Hymns Old & New (nothing to do with Ancient & Modern), verso print does not obviously show through on the recto, and vice versa. The same typesetter and music engraver, the laudable Andrew Parker, worked on the two editions, yet there has been progress toward a brighter, clearer printing. Music and textual credits have been moved to the bottom of the page, into space, allowing for a little more information to be given. For the three translations of Phos hilaron are given their Greek title in Greek script: a nicely revived tradition that flatters the singer. These three are John Keble’s text set to John Stainer’s Sebaste at 17, Christopher Idle’s more recent offering at 18 and Robert Bridges’s at 20, with the latter being the preferred translation of the rival English Hymnal tradition. It would take 2½ years to sing through all 847 items without repeating one, given four hymns every Sunday morning and three in the evening. Of course, there are always going to be some hymns that are not to the taste of clergy, musicians and congregations, and others that are repeat favourites. Some of the liturgical items might be used week in, week out, or not at all. The arrangement of the hymns follows the tried and tested pattern of the A&M stable: the diurnal of morning and evening, the seasons of the church year, saints’ days, a few service themes and the lucky dip of ‘Hymns throughout the Year’ (the odd name of the category used in Common Praise) or ‘General’ (the more sensible title in the ninth edition). The ninth edition’s categories are a joy: after the saints’ days, there are decent selections of hymns for Christian initiation, marriage, and funerals and the departed. Then there are selections of hymns chosen for use in a generalised sequence of sections of church services: gathering, penitence, the word of God, canticles and affirmations of faith, prayer and intercession, Holy Communion, and sending out. These mix hymns with liturgical texts, like the three modern Kyries (370–2) in the penitence category; the first is that from James MacMillan’s Mass of the Blessed John Henry Newman. The word category begins with the traditional sixth-mode Alleluia (374), and goes on to provide an Alleluia setting by Bernadette Farrell (376) and James Walsh’s Pilgrim’s Alleluia (377) — I am left to wonder why the Stanbrook Abbey hymn ‘Bright as fire in darkness’ intrudes at 375. There is also a Marty Haugen song that can be used as an Alleluia at 385, demonstrating the problem that items are arranged mainly in alphabetical order within categories rather then rational groupings. Thankfully the metrical Magnificats and other canticles are grouped together. The category for prayer and intercession includes a number of simple, modern chants that can be used as sung responses to supplications. It is not necessarily obvious, but four metrical settings of Gloria in excelsis Deo (413–16) are in the Holy Communion category, followed by two settings of Sanctus (417, 418) and one Agnus Dei (419). The 61 items in this category could really have done with a finer level of grouping within the category. The later categories of themes — the church’s ministry and mission, wholeness and healing, sorrow and lament, creation and the environment, justice and peace, and national and remembrance — are welcome, if still slightly thin. Even with all of these categories, there are still 246 ‘general’ hymns (29 % of the inventory). Still, this is an improvement on the like category of 265 hymns in Common Praise (42 %). There are hymnals, like Mission Praise, Sing Glory and Hymns Old & New, that take the unimaginative approach of arranging all their entries in alphabetical order of their textual incipits (though I do remember some old copies of Mission Praise took a unique approach to the alphabet!). Given a decent index, and the ninth edition has indexes aplenty (read on if you, like me, sadly spend more time in hymn indexes than with the hymns themselves), it makes sense to organise things by sensible categories and relationally. Thus, I am sure the compilers saw the need to keep the lucky dip to a minimum, recognising it as a sign of methodological laxity. A rough grouping of these hymns by theological themes would have been a welcome change, alongside better grouping of items within the other categories. The group of 17 ‘short chants’ at the end, mostly from Taizé and Iona, alongside some in other categories, will be a welcome addition in many churches. The indexes include the now standard and practical parade of biblical index, hymn suggestions for each Sunday and major feast, alphabetical index of tunes, metrical index of tunes, index of composers, index of authors, and the index of first lines and tunes. Alongside these there is a list of hymns ‘suitable for all-age worship’ that some might use, but also a particularly handy thematic index that lists hymn numbers appropriate to a wide range of theological and other themes. Some of these (e.g. marriage) exactly reproduces a category, adding the belt to the braces. Yet this extra index shows an appropriate response to the problem of categories: what to do with those items that fit multiple categories. It also allows for themes that are too vague to have been categories (e.g. water). The influence of Hymns Old & New (first Anglican Edition in 1986, with the popular New Anglican Edition a decade later, now superseded by others) can be seen in the ninth edition. Although Hymns Old & New has had major flaws in its musical arrangements and production quality, it brought together favourite hymns with choruses, praise songs and chants. Its coup was to provide what many churches wanted. Starting with Sing Praise, the Ancient & Modern tradition began to incorporate this wider repertoire, and the ninth edition includes symbols for guitar chords above the music for some items, thankfully not following Hymns Old & New in providing them for all items, even where they conflict with the musical arrangement. For controversialists, Stuart Townend and Keith Getty‘s ‘In Christ alone my hope is found’ is included (678), with its words ‘the wrath of God was satisfied’ in the second verse. Whereas some have rewritten the line, Getty has, understandably, refused to allow it to be used with an altered text. While American Presbyterians have recently decided to omit the hymn because of that line, it now makes Ancient & Modern look doctrinally brave/timid for including it. Categories: Anglicanism, liturgy, music | Tags: Anglican, Bernadette Farrell, Charles Steggall, church, Church of England, English Hymnal, God, hymn, Hymnal, hymnbook, hymnody, hymns, Hymns Ancient & Modern, Hymns Ancient and Modern, Hymns Old & New, John Dykes Bower, John Henry Newman, John Mason Neale, Keith Getty, liturgy, Marty Haugen, Mission Praise, music, New English Hymnal, Oxford Movement, review, Sing Glory, Stanbrook Abbey, Stuart Townend, Sydney Nicholson, William Henry Monk, worship | Permalink.